As the world waits for the next Bond installment, a new spy is in town. Due for release in UK cinemas later this week is Kingsman: The Secret Service, a new spy action film featuring Colin Firth, Samuel L. Jackson, Michael Caine and Taron Egerton. 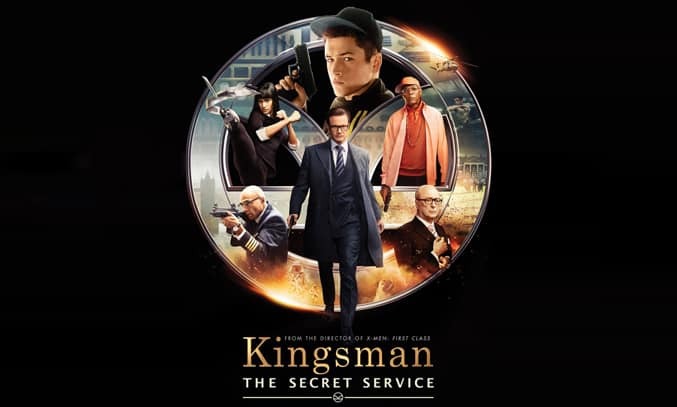 Based upon the acclaimed comic book by Mark Millar, Kingsman: The Secret Service tells the story of a veteran secret agent (Colin Firth) who recruits an unrefined but promising young protégé (Taron Egerton) into the world of espionage. Trying to survive in a world of petty crime, poverty and violence, Eggsy (Taron Egerton) lives in a brutalist apartment block with his mom and abusive stepdad. His biological father, who died when he was just a child, was a secret agent for a highly advanced, well-funded independent secret service organisation called Kingsman. Now that Eggsy has come of age, Harry Hart (Colin Firth) has recruited Eggsy for training. But as Eggsy makes his way through the agency’s ultra-competitive training program, a global threat emerges from a twisted tech genius called Richmond Valentine (Samuel L. Jackson). He plans to conquer the world by hacking our mobile phones with his elaborate and convoluted plan to tackle climate change. Clever, entertaining and seriously funny, Kingsman: The Secret Service is a fresh, fun take on the classic British spy genre. The agents are well-tailored, well-mannered and well-equipped with plenty of killer ‘Q’ type gadgets. The villains are super cool, super evil and super silly. Add to this a far-fetched, theatrical storyline, a gorgeous female henchman (with razor-blade prosthetics for legs), a killer soundtrack and plenty of witty one-liners and you’re onto a winner. Director Matthew Vaughn does a fantastic job of capturing the grimness of life on the streets against the fascination and excitement of espionage. The film’s special effects are equally brilliant, particularly the slow motion martial arts scenes that are so good, they give the Matrix a run for its money. Colin Firth is superb as Harry Hart, the veteran secret agent who is one minute musing on the importance of a bespoke suit before dispatching a band of villains with precise alacrity the next. His natural style, wit and British aloofness make him the ultimate gentlemen secret spy, in a role that is supported by Mark Strong and Michael Caine. Samuel L. Jackson is equally good as the master villain, Richmond Valentine. The American actor does a fantastic job of bringing the eccentric billionaire to life and old fashion comedy back to the role. But the film truly belongs to Taron Egerton who plays the promising young protégé Eggsy. The Welsh actor does exceptionally well in his first major big-screen role, capturing the character’s resentment and suspicion as well as his longing to make something of himself. Fresh, fun and wildly enjoyable, Kingsman: The Secret Service may not be as suave, sophisticated or as well-loved as Bond but its sure to put a smile on your face. Kingman: The Secret Servic is on general release in the UK on 13 February 2015.